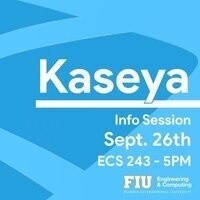 Join us as Kaseya visit to talk to us about their company and job opportunities. Please bring your resume. Every year, the FIU's SCIS host Employer Information Sessions on campus, often in conjunction with Career and Talent Development or with participation in Career Fairs. During these sessions, employers make presentations on topics that include the organization's career opportunities, culture, and products or services. Usually, you will have an opportunity to speak with the representatives in small groups or one-on-one before or after the presentation. Professional or "business casual" dress is appropriate unless otherwise indicated and have your resume ready.